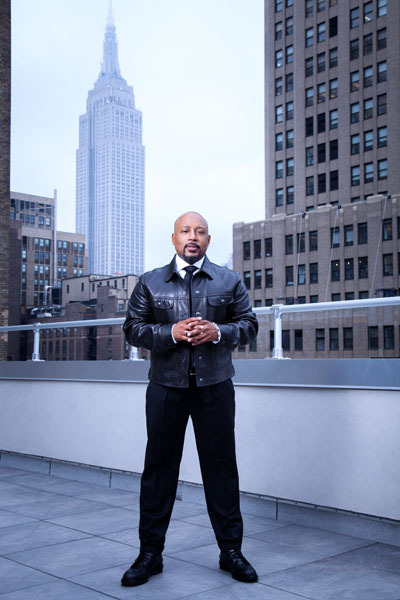 Embodying the American Dream is serial entrepreneur Daymond John. 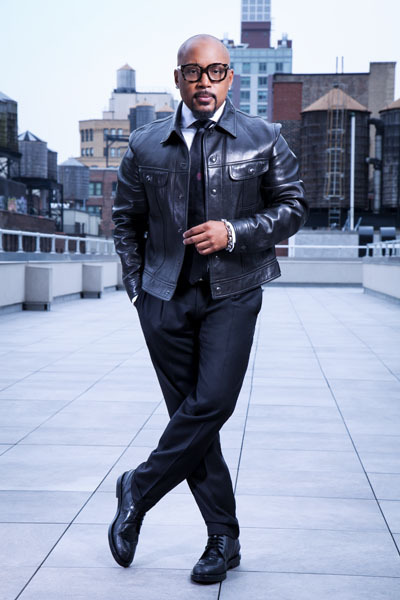 Proving that anyone can make it in this world, he started his company with just $40 which has grown to a $6 billion fashion powerhouse. Sure his stratospheric rise to success wasn’t a straight line, he humbly accepted and overcame his failures, learned from his mistakes, and recently just beat cancer, for he understands that life it is all about the journey not the end goal. 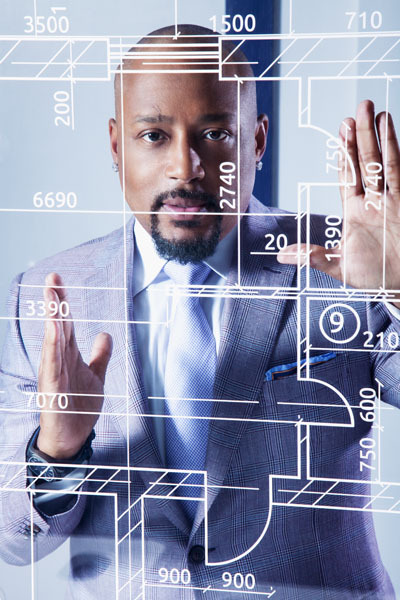 As a mentor, he continues to bestow his knowledge and experience to other entrepreneur hopefuls through his investments on Shark Tank, his recent think tank workplace- Blueprint + Co, and his best selling entrepreneurship books and interactive motivational curriculum programs. 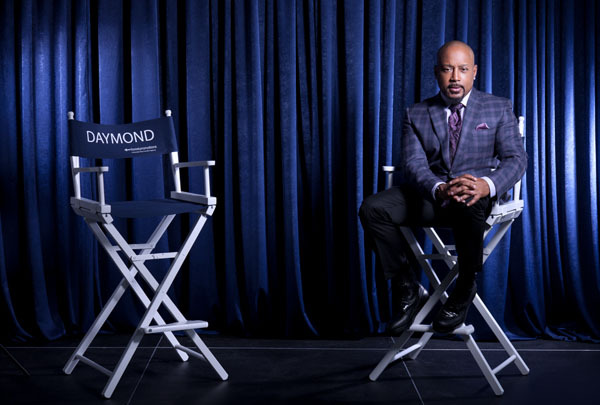 Here Resident Magazine speaks to the larger than life icon- Daymond John. RM: As an entrepreneur, what motivates you the most? DJ: I think because the times are changing so fast it’s almost like opening a cracker jack box. I’m learning new techniques on how to operate and grow businesses and utilize technology which is exciting. The business has changed since I started 25- 30 years ago, it’s not the same. Though the fundamentals are the same, the form of delivery, production, advertising and marketing is different as we know it. I find it fascinating to bring the fundamentals of what I know to the current day and age. RM: How do you decide which project to take on and to champion? DJ: I have to have a really strong passion about the project and like the person that I’m partnering with. Today a lot of my products such as a shark company or a type of curriculum include innovation or empowerment. I’m just this kind of lightening rod now, because I do so many things like speaking to many corporations or starring on Shark Tank. If I see a product I can sink my teeth into or I’m actually obsessed with or it’s worth my time, money and resources then I will invest. 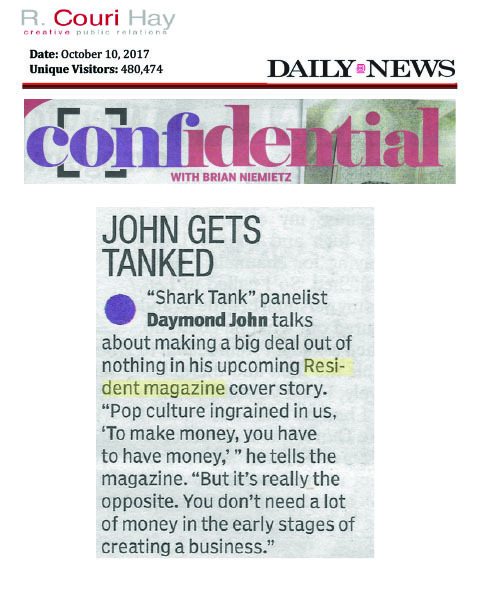 RM: What do you think was your best investment from Shark Tank? DJ: One of the deals I’m extremely happy about was the Bombas socks deal. These young men came in and were only making a couple thousand dollars per year and now they’re on track to do $50 million this year. But what makes this company so great to be a part of is that every sock that they sell they give a pair of socks to a homeless shelter because they know that the main challenge the homeless face is the lack of care for their feet. That’s why I love the company so much. RM. Were there any deals that you felt were ‘the one that got away’? DJ. No, fortunately we don’t feel like that because we try to pair the perfect shark with the perfect product and partner to help run it. So we never really feel like that with any of the investments. RM. How do you balance launching your new businesses in conjunction with what you’re doing with Shark Tank? DJ. This is a challenge we face because Shark Tank takes a lot out of us and we have to limit the amount of businesses we can launch. What I personally try to do is launch one new business every 3 years because my inventory and time is all I really have to move around. On Shark Tank we really have to roll up our sleeves and work with these companies. Sometimes people just need the money to grow and will run on their own business, but the ones in the middle need help and take up a good amount of time so we need to figure out how the teams will work together. RM: How did you come about the concept of Blueprint + Co? 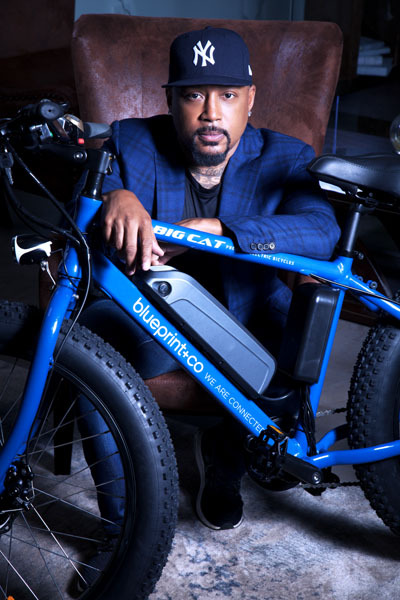 DJ: The Blueprint + Co concept came about as a shared workspace for many Shark Tank companies that needed help as well as some of my other fellow investors and established companies who could all work in the same space. One of the members is Ashley Stewart, who has a large business with 100 people based out in Secaucus, New Jersey. They want to attract young talent who want to work in the city without having to travel to Secaucus, so they have a couple of desks there. Also the CEO over there and several other CEOs love to come into the blueprint space where they can see and meet with other CEOs on the same level and we can figure out ways to collaborate together. RM: How has this been received? DJ: It has been absolutely amazing. In the five months since its launch, we now have a great amount of people there and I’ve seen many collaborative efforts going on between the fellow shark companies based there and I’m very proud of the product. RM: What is your latest project? RM: You have had a colorful life journey. What were some of the biggest life lessons you have learned? DJ: Number one you have to be extremely passionate and love the company, brand or product you’re putting out there, because if you do it because you want money or fame you’re going to be miserable and you’re going to fail at it. Or if you finally get the money you spend it all right away because you have been waiting so long for it. Financial intelligence is key. It has nothing to do with massive amounts of business but how you are operating with every dollar that you have. You don’t need a lot of money in the early stages, pop culture ingrained in us ‘to make money you have to have money.’ But it’s really the opposite, you have to build a community and then money helps you grow the business but it doesn’t start the foundation of the business. I’ve learned this through personal experience which is the basis for my book, The Power of Broke, where I can tell people how to grow a business. RM: The Power of Broke became a New York Times Best seller and now you’re in the process of writing another book- Rise and Grind? Tell me a little bit about your message. DJ: I didn’t think people were going to relate to The Power of Broke because I thought people would read the title and think ‘I don’t want to read about when he was broke.’ The message there was that you don’t need money to make money, 65% of many successful people in the world are self-made and were broke. Even 65% of athletes or lottery winners become broke within 3 years. Rise and Grind is about getting granular on the theory about the methods and tactics that I need to do every single day to reach my goal. I studied 15 well known or successful people to figure out what do they do every single day for the first 90 minutes or the last 90 minutes, what are the methods they’ve either forgotten or carried through since they were young which they go back to that made them successful. I’m trying to create blueprints on these people with their exact ways to make themselves better. This launches in January 2018. RM: You were a dyslexic that didn’t attend college, what does it mean to you to have such an overwhelming response to your books? DJ: It’s an honor because there are too many of us that are self-doubting. I love the fact that after people read my book they say if he can do it, I can do it. I had absolutely zero, so there were no excuses, as long as I had my health I can do it. Too many people judge their blooper reels against other’s sizzle reels on Instagram and think people wake up beautiful, in shape and educated, and it’s not really reality. When they read about me and all of my flaws they can feel empowered to become accomplished and I want them to share that with everyone they know. RM: How did you find out you had cancer? DJ: I had an executive physical at UCLA which is a very extreme and extensive checkup and they found a nodule on my thyroid. They took a biopsy and we took it out. When they conducted some tests on it they found out it was a stage 2 cancer. The most shocking thing about this was that I had physicals done every year and I realized this was a very touchy subject because people don’t want to think about their health and are afraid they may find out something is wrong. I wanted to share the importance of early detection which is what saved me, and I was able to avoid massive complications. Because of it I am able to go on and enjoy my life to be here for my kids. I want to encourage people to go and get mammograms, pap smears, endoscopies, or colonoscopies to see if they are ok or need to fix something. I will have to monitor this for the rest of my life but this is part of the process and my number one project. I think entrepreneurs don’t take care of themselves enough. But you can’t have success if you don’t have your health. RM: If there was a dream project to become involved in what would it be? DJ: It would have to be a solution to something that would change people’s lives. Like stopping human trafficking or providing clean water to all.